Yesterday my picture was of a Hawk of the metal, mechanical kind, today is a hawk of the raptor kind. 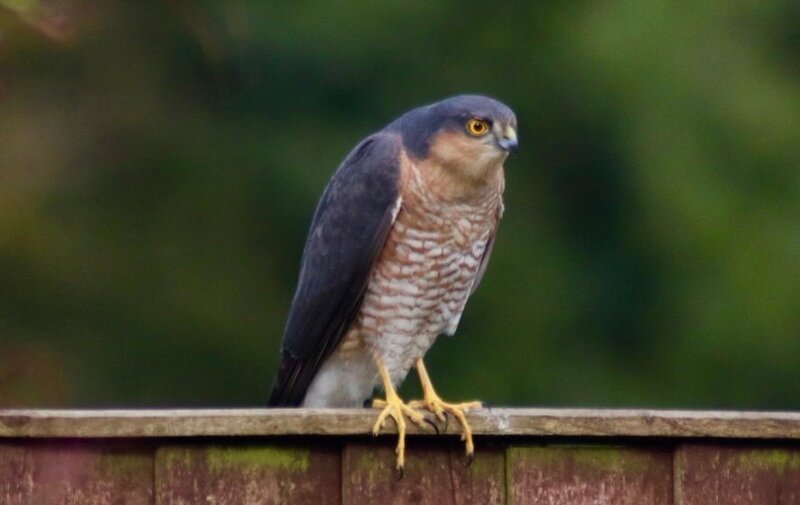 This one visits our garden quite regularly & when it does the other birds rush off elsewhere. They are amazing creatures, so beautiful but so savage ! Wow I bet they do fly away! Well captured, he really does look as though he is on the prowl. Such a great visitor and capture - they hover round from time to time , but the only time I saw one in the garden ,when he plummeted down and captured a beautiful gentle collared dove - I still remember the feathers floating down as he took wing again and carrying off his victim ! Nature can be so cruel! great capture of this regular visitor. So long as I put the feed out for the smaller passerine birds, I’m basically putting feed out for her. I saw her take a squirrel the other week, just before I was going to shoot it. He's gorgeous! I like the fence he's perched on. Nice focus on his eye. They have such an intense look. My husband use to comment that he'd know when one was in the yard because no other birds were! How lucky you are to have such a wonderful visitor. He is beautiful. I don't blame the other birds for leaving. That’s awesome Carole. Well captured.